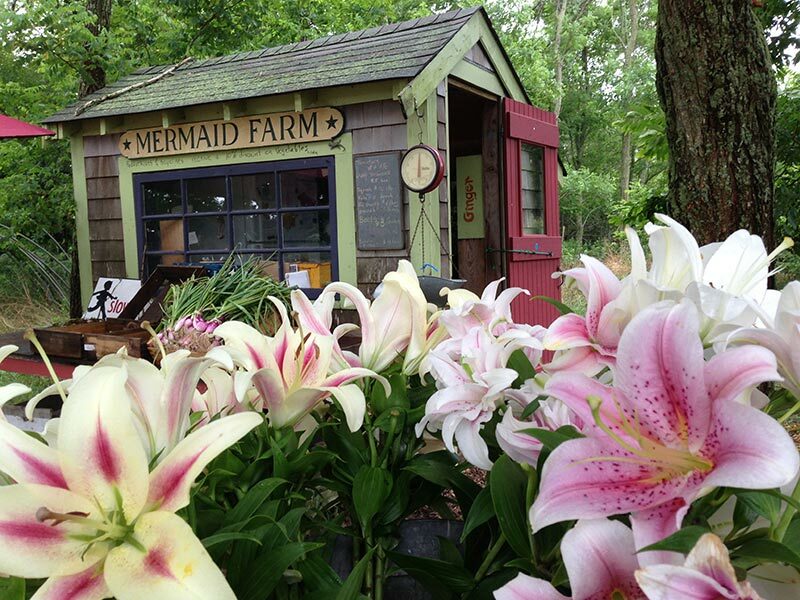 Home Community Crop report: What’s growing and selling at Martha’s Vineyard farmstands. Crop report: What’s growing and selling at Martha’s Vineyard farmstands. I set out to visit a few Island farms this morning knowing the traffic would be horrendous because of the gloomy weather, but even as I drove back down-Island through Vineyard Haven at lunch time – awful – I felt it was completely worth it. The quiet calm at Beetlebung Farm and Mermaid Farm, and even the busy Alley’s Farm Stand was a nice break from down-Island. I had never been to Alley’s Farm Stand before. It’s really a mini-market with a lot of Vineyard-made goods: Net Result dips, produce from various Island farms, M.V. Sea Salt, Not Your Sugar Mamas cookies, and Enchanted Chocolates, to name a few. There were plenty of pints of fresh Island blueberries from Palches Blueberry Farm ($7). Alley’s Farm Stand, behind Alley’s General Store, State Rd., West Tisbury. 508-693-0088. I had also never been to Beetlebung Farm, and I’ll definitely be going back. First off, there’s obviously the standard farm stand and today there was garlic, kale, chard, small tomatoes ($5/lb. ), cucumbers, carrots, beets, flowers, and eggs. But when you go in the small shed to pay, there’s even more to pick from: today there were scones and cookies from the Chilmark Cottage Baker, Chilmark Coffee Company coffee beans, gourmet olive oil, grass-fed beef, as well as paintings for sale by Marie F. Scott, ladles hand-blacksmithed on the Vineyard, pottery, and letterpress cards by farm manager Emma Nicholas Young. Beetlebung Farm, Middle Rd., Chilmark. I was really looking forward to a mango lassi for breakfast from my last stop, Mermaid Farm, but no luck this morning. Instead, the fridge was packed with cheese and yogurt: whole milk plain yogurt, feta, and “Fromage,” their soft, creamy cheese. Outside on the produce table, the heirloom tomatoes looked great ($6/lb. ), as did the red onions, and flowers: lilies and sunflowers, sold on the property from Black Cat Flower Farm. Mermaid Farm, Middle Rd., Chilmark. 508-645-3492.